It's been a long time since this card has seen a reviewer's e-mail. If you didn't play 2 of it when PSV was out, you may have been called a n00b. Basically, it was Beatdown, Man-Eater Bug, and searchers almost ALWAYS being played face-down. It's one of the reasons Beatdown won. As I have said to people asking for advice way back when..."Beatdown doesn't fear the face-up monsters -- it should be able to overpower them. It's the face-downs that will give you the trouble every time. Nobleman takes care of that." No cost to activate -- Remember Tribute to the Doomed, anyone? More players are playing Sangan and Witch face-up...it's about half and half so it seems. Either face-up to avoid NoC, or face-down because Scientist bringing out Dark Balter is a thorn in their side. How good is it? I play 1 of it, and Swords myself. I used to play 2 NoC, but Swords was an overall better topdeck. Granted, NoC removes the threat, but sometimes you WANT the effect to go off (flips, especially Fiber.) And at worst, now you know what you're up against if Swords flipped it. The winner at the February Butler, PA Regionals (post DCR restriction list, pre-IOC) used the maximum of two. They helped him a LOT. Nobleman of Crossout is a Normal Magic card that was a Super Rare in PSV. This card was run ubiquitously when it first came out, and with good reason. At the time people still played many Flip Effect monsters, and NoC was the perfect card to screw them over. Afterward, however, people began limiting their FLIP monsters; thus, the use of NoC dropped. Now though, the playability has grown again. People often run either Fiber or Cyber Jar (or both), along with Magician of Faith (or Magical Merchant) for Chaos decks and even the occasional Morphing Jar. Add in Witch, Sangan, and the ever-popular Tomatoes and Angels, and NoC has quite a bit it can kill. It's making a comeback, and rightly so; I would recommend at least side-decking one of these. Hey, in a pinch, you could always Book of Moon something and then cross it out. It's semi-restricted for a reason. Tony Ahhh, the good ol' Nobleman of Crossout. I call this the most set trap in the game! Honestly, no one EVER plays this card from the hand unless its first turn! dxP haha...I've had times where Nobleman of Crossout was just in my hand doing nothing. It didn't kill any thing and it was just a bluff. But I've had times when I had a huge creature and it got rid of Fiber Jar, DD Warrior Lady, etc...all the good stuff. But once again...I had times where it didn't do any thing...Here's what I think of this card. I feel like I'm the only guy in the whole wide world to not use Nobleman of Crossout. I don't use it for 1 good reason: I hate losing because I have Nobleman of Crossout. It's weird because I do tend to board in Nobleman of Crossout when I see my opponent use a lot of Flip Effect monsters but I still don't like it. This card basically says you can only use this card IF there is a facedown creature in play. Well we always set Witch/Sangan/Sinister face-down first turn right? DD Warrior Ladies are always set too. This card seems like the perfect card first turn. I mean if it's a Witch/Sangan/Sinister set, you don't have to worry about a Torrential Tribute that's set behind it. Or you don't have to worry about Fiber Jar being set because that's your opponent's only out left. Well you are right. IT IS the best card to have in your opening hand and THE best facedown creature removal. But the problem with this card is that you can't always expect your opponent to set everything. If you think about it, in the late game...no one sets Sangan, Witch, Tomato, DD Warrior Lady, and sometimes even Sinister Serpent. So what good is Nobleman of Crossout compared to DD Crazy Beast and DD Warrior Lady? The purpose of the over verbose article is that Nobleman of Crossout IS a good card.......but only in the first turn and during the mid game when your opponent is setting stuff. Come Top Deck mode, it's not the best card. What could replace Nobleman of Crossout in everyone's decks? DD Crazy Beast is one of them...3rd DD Warrior Lady is another. 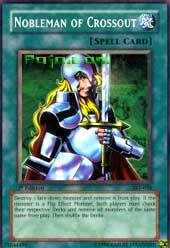 I don't like Exiled Force as a replacement because of Torrential Tribute and if you kill a Witch/Sangan/Sinister that way, it's almost pointless. I'll never make a deck/side deck without Nobleman of Crossout. It's a given. But I still do not like it in a lot of decks because of it's "usefulness" or lack of it. know by now is, “Destroy 1 face-down Monster Card and remove it from play. were used more frequently. But now, its real iffy in a solid deck. that I see in play (which are morphing jar #1, cyber jar, and fiber jar). Decent card, but stick it in the side deck.